“When you want depth in a woods picture avoid sharp edges and contrasts. Mould for depth, letting the spaces sink and sink back and back, warm alternating with cool colour. Build and build forward and back.” Emily Carr, Hundreds and Thousands, pp. 295-96. 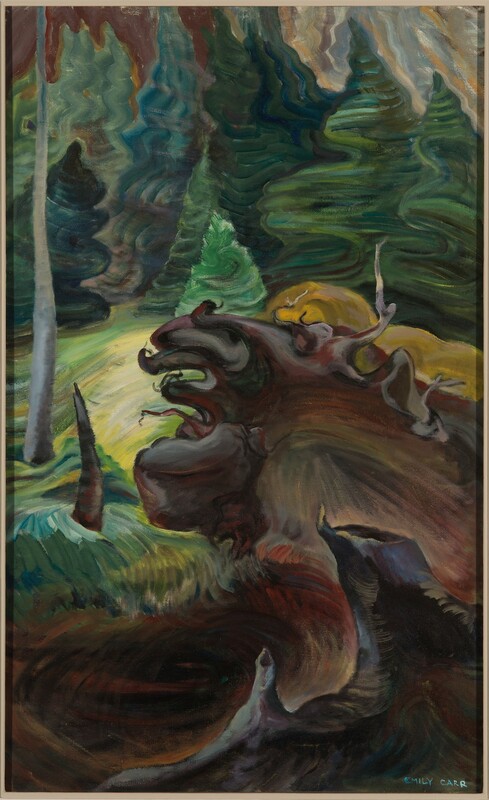 Best known as a painter and author, Emily Carr (1871-1945), has been described by The Canadian Encyclopedia as “a Canadian Icon”. Carr’s professional and personal records, along with over 1,100 works of art, are preserved and made available by the BC Archives. The collection spans her entire career and includes manuscripts, major paintings in oil and watercolour, drawings, cartoons and works in clay and fabric. Carr’s work received greater attention in the last years of her life. Recognition coincided with her emergence as an author. She published Klee Wyck, (1941) The Book of Small (1942), The House of All Sorts (1944), and, published posthumously, Growing Pains (1946), Pause, The Heart of a Peacock (1953), and Hundreds and Thousands (1966). This important later work was purchased in 1945 by the Province from the artist’s estate.